What Happens When Teammates Take Their Rivalry to Twitter? Update: Since this article was published, Gabby Douglas has come out publically on her instagram account as one of the victims of Larry Nassar. This is a reminder that social media never tells a story in its entirety. Aly and Gabby are both victims of a disgusting crime and this twitter exchange is evidence that they are in different places as they process the trauma that they have endured. Over the weekend I opened Twitter to find what was once a friendly rivalry between two of the top all-around gymnasts in American history get twisted into an emotionally charged exchange of opinions. 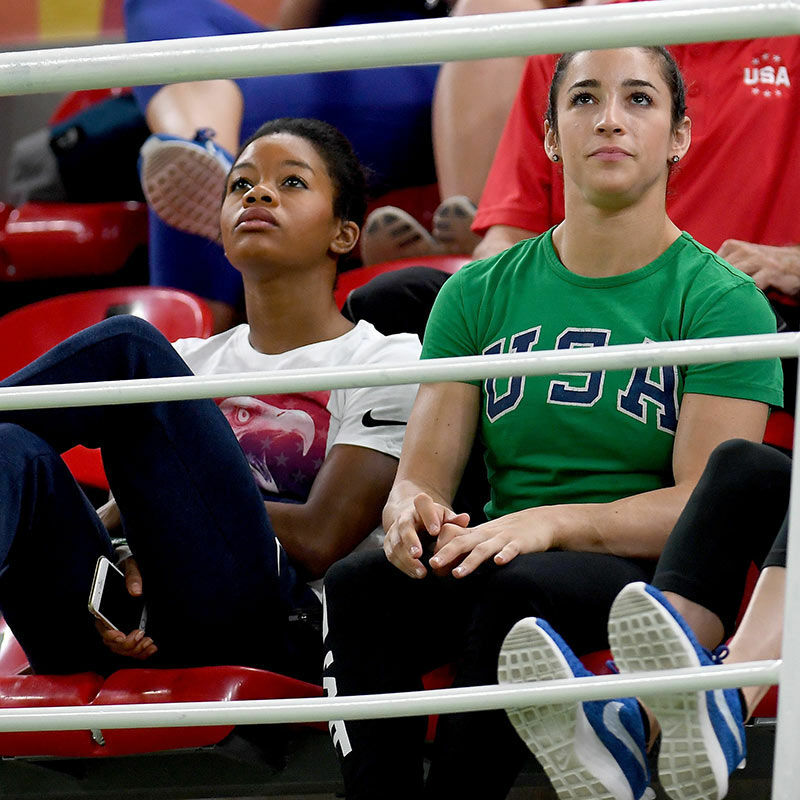 Aly Raisman and Gabby Douglas, members of the gold medal-winning gymnastics team in Rio, now found themselves on seemingly opposite sides. So much has happened since the Rio Olympics. USA Gymnastics has been rocked by a heinous sexual abuse scandal. Since the revealing of this scandal to the public shortly after the Olympics; Aly has been outspoken about the need for a culture shift within USA gymnastics and in society's culture as a whole specifically related to the objectification of women and sexual violence. Recently, Aly came forward as a victim of sexual abuse. She is using her platform as a successful Olympic gymnast to advocate for her teammates and other victims of sexual assault, harassment, and violence. Immediately, the Twitter community jumped to Aly’s defense and tore Gabby apart. This Twitter thread is so disheartening. Both women have valid insight yet the execution of these tweets caused a Twitter war that left Gabby portrayed as the villain. Aly is absolutely right. No matter the attire or situation no one has the right to abuse or harass a woman. God sees all abuse and He does not condone it, so neither should we. The Lord hates and is grieved by all wickedness, including sexual assault, harassment, abuse, and the objectification of women (Ps. 11:5). But Gabby’s response is also biblically accurate. In his letter to the Corinthians Paul exhorts, “Do you not know that your bodies are temples of the Holy Spirit, who is in you, whom you have received from God? You are not your own; you were bought at a price. Therefore, honor God with your bodies” (1 Corinthians 6:19, 20). Women—like men—make choices every day about what to wear and how to present themselves. Christ-followers are called be set apart from culture; meaning we must think differently, act differently, and yes, even consider dressing differently from the secular culture around us. Our body is not our own. What we wear needs to reflect our faith in Christ. What can Christ-followers takeaway from this Twitter exchange? No one has the right to sexually assault a woman, regardless of what she is wearing or the situation. Sexual assault is a horrendous sin, a sin of an abuser—not a sin of the victim. Our energy should go towards loving the victims, not shaming them for clothing (or lack thereof) they chose to wear. This is also a reminder to Christ-followers to not be quarrelsome, but to be kind and gentle (2 Timothy 2:23-26). Social media often is a breeding ground for quarrels. In this particular case, Gabby’s response is certainly true, and Aly is obviously using Twitter to take a stand on an issue that has directly affected her. Social media may not have been the best place for Gabby to address this with her teammate. Especially when taking on emotionally loaded issues like sexual abuse and harassment, it’s too easy to be misunderstood or misinterpreted, or to come across as something other than what was intended. Teammates have direct access to one another, and should use it instead of challenging one another in front of the social media wolves. Let's keep that in mind the next time we choose to use social media to share our stance on emotionally charged subjects. Lastly, we are called to be a light in the world. Jesus has more compassion for the suffering on earth than we could possibly imagine because He too has suffered greatly on our behalf. Are we showing compassion to the people God has placed in our lives? Are we displaying that truth well? Your family, friends, teammates—and yes, even your rivals—desperately need the compassion, love, and acceptance that Christ has to offer.